The season has arrived, Christmas is just around the corner and with that comes the desire to gather with family and friends. Most of you will be planning a Christmas party this year, where you invite coworkers, friends or family to gather and enjoy the festivities that Christmas brings. While a Christmas party may sound fun, there’s a cost involved that may not be so fun. 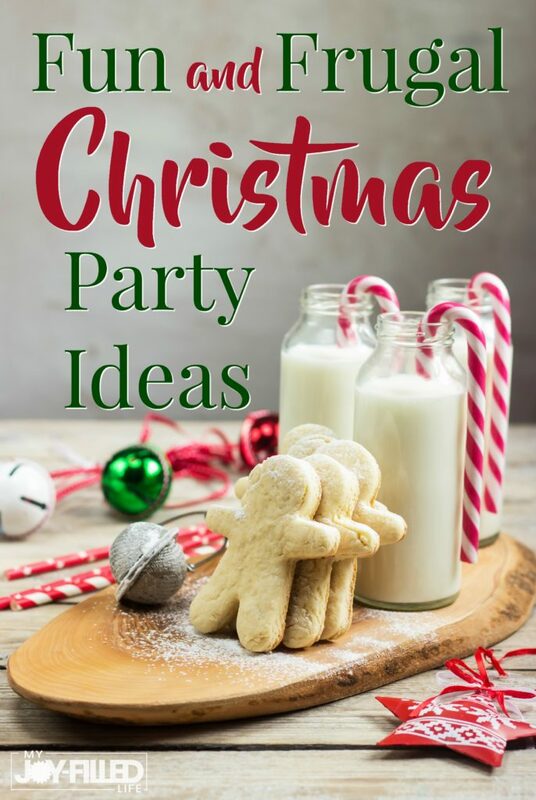 Today I am sharing some fun and frugal Christmas party ideas to help inspire a cost-effective way to enjoy the holiday without going broke. Everyone loves an ugly sweater party! This year try to host an ugly Christmas sweater party. The awesome factor with this Christmas party theme is that you can shop a thrift store or make your own ugly Christmas sweater using old clothing. Invite family and friends to get creative with their ugly Christmas sweater and have a vote based on creativity and frugalness. This will inspire the family to gather for a fun and frugal Christmas party without being rude. Invite friends and family to a DIY Christmas décor evening. You will all gather up odds and ends from each other’s homes and arrive with a stockpile of creative crafting items. As you gather around in the chosen home together for a Christmas party, you will then work to create DIY Christmas décor that guests may take home to make their house feel more joyous this holiday season. This is a fun and frugal Christmas party idea that serves two purposes; to decorate each other’s homes and socialize. This is one party that is ideal for including the kids too – there are lots of cute and creative ornaments kids can make for the tree. Rather than purchasing new gifts for all family members, host a silly gift exchange Christmas party. Create your list of guests with family and friends. Assign each of them the rule that each gift must be silly in nature. Put a cost limit on the silly gifts and as guests arrive, they place their gift under the Christmas tree. Once all guests have arrived, anyone who brought a gift puts their name on a piece of paper, draw names and exchange those silly gifts. Lastly, you can host a potluck style Christmas party where each guest will bring an appetizer, dessert or meal item to share with the family. Consider keeping track of what each member brings so that you don’t end up with duplicated meal options. This is the best way to have a fun and frugal Christmas party because it alleviates the burden of spending tons of money on food as the host. A potluck Christmas party is also a fun way to try your family members’ recipe ideas. One of my favorite things to sip on this time of year is a yummy mug of hot chocolate. Why not enjoy some with friends and family and plan a get together with a hot chocolate bar with lots of fun stir-ins and toppings. Have everyone bring a topping or stir-in to share so that the cost doesn’t all fall on the host home. As you drink your chocolate creations, play (and sing) some Christmas music or enjoy some Christmas party games. Invite friends and family over to decorate cookies together and then exchange cookies to take home. Or everyone can prepare a certain kind of cookie before hand and then swap and/or eat the cookies at the party. Every family has holiday traditions that make them happy during the Christmas season. This year I invite you to use some of these fun and frugal Christmas party ideas to switch up the traditions in a way that helps save you money. Being frugal doesn’t curb the fun factor; it simply makes you enjoy the fun more because you will know you have stayed on budget while planning this year’s Christmas party. You could even combine more than one of these ideas into one festive party! What are some ideas you have for a frugal, yet fun, Christmas party?